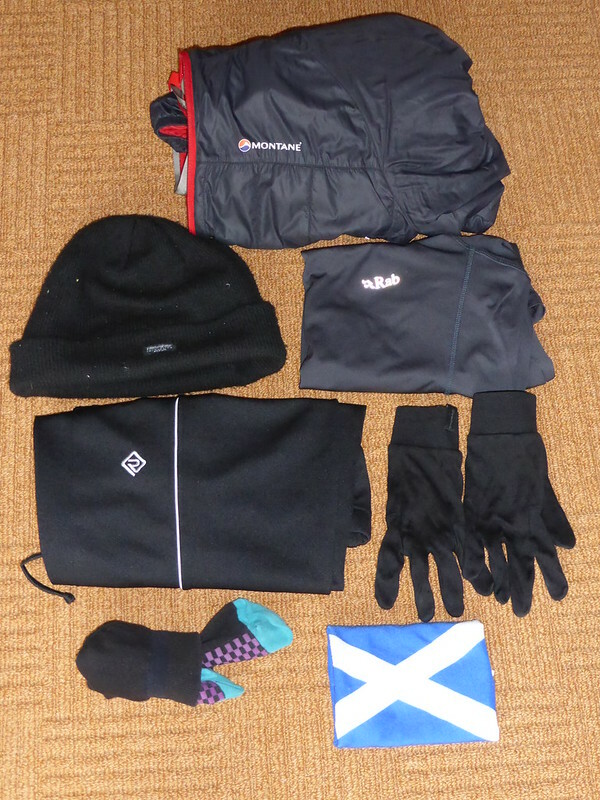 My last blog entry, on my winter kit list, certainly seems to have been popular. I guess that's the gear geeks showing themselves. 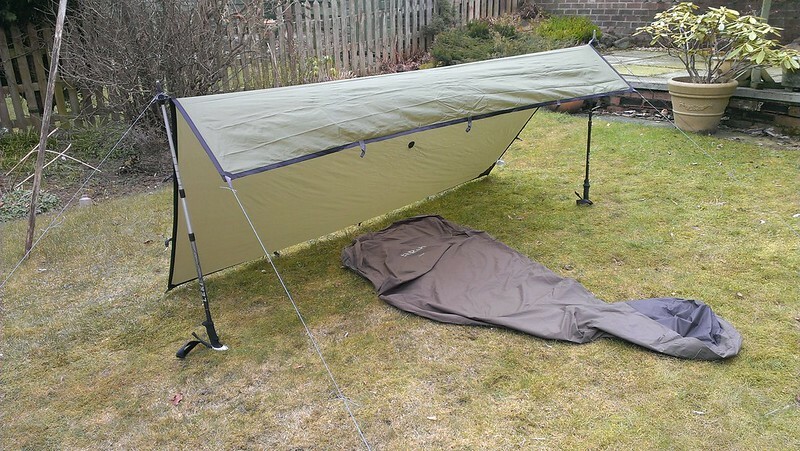 I also hinted that I was looking to change a few items as we hit the better weather and I have been keen to try the whole bivvy and tarp option that many lightweight backpackers and bikepackers are now using. To this end, I bought myself a Rab Ascent bivvy bag and a Siltarp tarp. The Ascent met my number 1 criterion - it has a midge net. Now maybe I'm just unlucky, or I was born with the wrong gene, but I'm an absolute midge magnet. Having tried a few products over the years I've found only two that work. Deet, at a high concentration, seems to keep the blighters at bay but it smells & tastes horrid and can damage certain materials and plastics. I found Smidge a couple of years ago and that seems to work just as well but with none of the side effects. However, I'm still not confident enough to want to fall asleep out in the open in a Scottish summer. The midge net on the Ascent bivvy bag can be removed if not required but neatly zips across the opening ensuring loads of fresh air without being eaten alive. 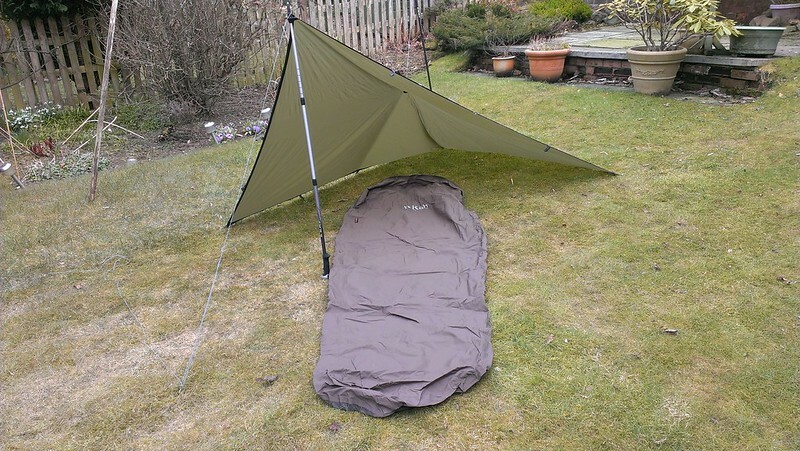 The tarp I bought has enough loops on it that it can be used in number of configurations so I practiced in the garden, learning and re-learning a few knots that would be handy out in the wilds. Another option - requiring a couple of poles or handily placed trees. Keen to use the new equipment, I asked a few friends if they were also up for a night out at a spot I had spotted a couple of weeks previously near Blair Atholl. Before long we had a small posse together and Saturday afternoon saw us heading north up the A9, past all the Etape Caledonia entrants doing their registration stuff in Pitlochry. A couple of beers in the Bothy Bar at the Atholl Arms (and a plate of Haggis Nachos for a very hungry me) and we were then heading up around the Glen Banvie loop. This is a straightforward section of estate road with a couple of wee climbs to gain some altitude and makes a pleasant 9 mile cycle in the country. However, I had decided to see if we could get to the top of the little summit of Fair Bhuidhe reckoning that the views would be more open. That meant a good bit more climbing, including a bit of pushing as the terrain got wetter and my Marathon Mondial tyres started to lose traction. Almost at the top, we made a detour to a the remains of a very old watch tower overlooking Blair Castle. I have to say that I was very surprised. I'd expected an old Forestry Commission wooden tower but this was clearly much older and had been much more substantial. Beside this tower there was also a little ruined building that would have been an ideal spot to set out a bivvy bag. However, as the the other three were in tents and this little ridge was a bit blowy and exposed we opted to head to a clearing right at the very summit. This necessitated a push through some draggy heather that was particularly bad for Jimmy as he'd opted to tow a trailer. However, he struggled on bravely and we were soon inspecting potential pitches. This was where I had to start thinking a bit differently. I hummed and hawed for a bit before finally selecting a little hollow between some heathery bumps and under the spreading branches of a tree. While the other guys were cracking on apace with their tents, I had to search around a bit for a decent stick I could use as a prop for the tarp, then guy it all out. Even a simple chore like getting the sleeping mat organised turned into a potential issue. The other guys had already started cooking before I was settled and I was lucky it wasn't raining as I got everything sorted out. When I eventually started on my dinner, Andrew was collecting firewood from the substantial amount of windfall and, after a couple of attempts, eventually had a fire going. It's strange this one. I very rarely bother with such a thing. By the time I've ridden or walked all day then cooked a meal I'm usually happy to sit and contemplate nature/the sky for a while then head into my sleeping bag. However, get four guys together in the wilds and some elemental change seems to occur. It was certainly a lot more sociable and it was as well I'd brought some wine as well as whisky as it was well after midnight before we were all ensconced in our various sleeping systems. And how was I feeling about this? Well, pretty cosy actually. In the pitch black it was impossible to tell I wasn't just in a tent. Only the amount of fresh air really gave the game away and I was soon fast asleep. I awoke around 5am, just as the sky was getting lighter, to discover that (a) my sleeping mat had gone flat and (b) the inside of the bivvy bag was very wet. I think these two things might have been related. With the mat flat, the bivvy bag had got twisted in the night and I'd managed to pull the much less breathable bottom part round to the top. That meant my body vapour was condensing on it. The part of the bag that was made of the Event fabric still felt OK. As for the mat, the best I could do was blow it up again, hoping it would retain some air until it was time to get up. I don't know that I slept much after that. I was content to poke my head out of the bag and watch the sky gradually getting lighter. Eventually though, approaching 8am, I decided it was time for breakfast and set about doing this from the comfort of my sleeping bag. 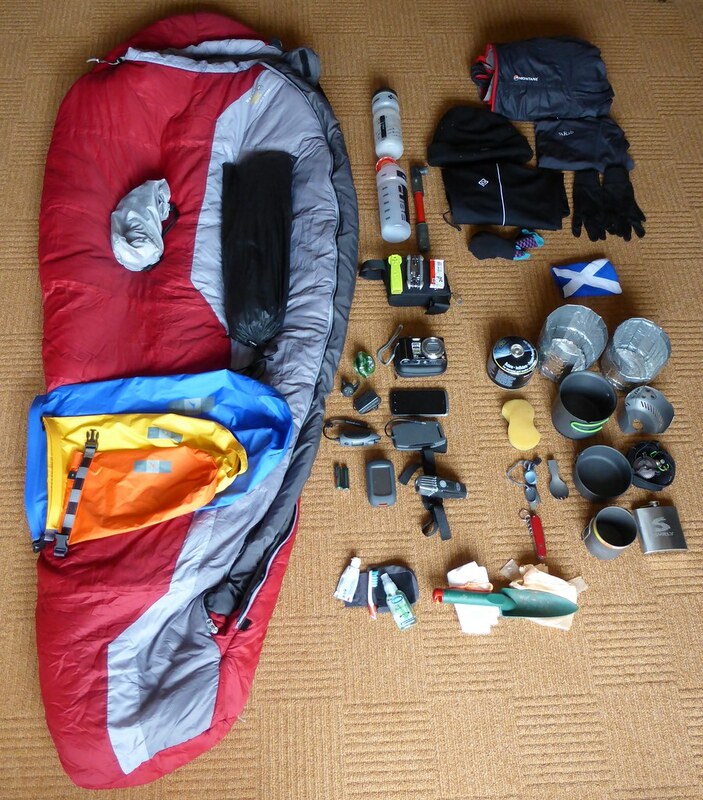 Much as when in the tent, organisation of your gear is vital so that everything is handy and easily found. In fact, it's probably even more essential under just a tarp as it's easy for things to get lost in the heather. When packing everything away, I was again grateful it wasn't raining. Simple tasks like getting a sleeping bag packed away into a dry bag are just going to take much more care when not having the comparative luxury of a tent to do it in. The route I'd chosen back to the car park involved another heathery fire-break to a mapped estate road. However, this road was frequently blocked by trees and very wet in places. Again, I was cursing my tyre choice as my steering was often non-existent. Upon reaching the main Glen Banvie track again, I somehow persuaded everyone that it would be better to do the slightly longer route back. This also gave us the opportunity to check out what had been my fallback camp spot had the weather been too wild the previous evening. A wee detour to the Falls of Bruar and we were soon enough back at the car park for a slap-up chippy!! So - what are my impressions of bivvying? I was surprised how much time it took for me to get it all set up. On the right terrain, a tent would be quicker. Organisation is pretty essential. I was forever losing stuff in the grass and heather. There's not a massive amount of weight saved once a tarp and pegs (and potentially a warmer sleeping bag) are factored in. My sleeping bag was definitely more damp than it would have been in a tent, though this was due to the bivvy bag twisting. There is definitely a wider selection of places to bivvy than to camp. I'd have been happy in the wee ruins we'd passed. If it hadn't been for the other guys having tents I'd have pitched up further into the woods where the ground was flatter and less heathery. There's certainly a pleasant vibe from waking up in the open. I really enjoyed that aspect of it and on a summer evening I can imagine enjoying it even more. In short, I obviously need to do more. I reckon some of the disadvantages will reduce or disappear with experience and, even if it's only for single-night trips, I'm sold on the concept. Edit: the leaky mat was due to a known manufacturing fault which is supposed to have been resolved. I've been asked to return my mat to the UK distributors for inspection and replacement. I'll provide another update if/when it arrives. 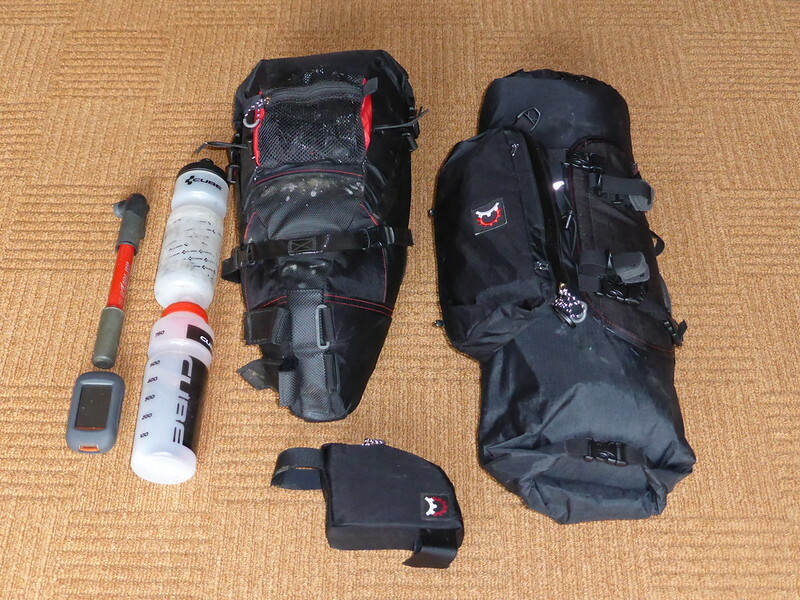 A few folk have been asking me questions about the gear I've been taking with me on my Bikepacking trips this winter so I thought I'd spend a little time going over it all. This is nothing like an in-depth review, just some comments on my experiences and some reasoning for why it is in my bags. Technology in lightweight camping gear (in the form of materials and design) seems to be in a high state of change at the moment with many old favourites now regarded as a bit old-hat. It's fair to say that I haven't moved on so quickly and there are many developments I've not yet explored for one reason or another. Anyone who wants to track down some of these could do a lot worse than investigate the Bear Bones Bikepacking website and forum. First of all, here's everything laid out. The sleeping bag is a Mountain Hardware Lamina 0. It's synthetic, which has been a big change for me as I've always used down bags in the past. It's heavier (1,681g) and more bulky for its warmth rating but I'm less worried about getting it damp or dirty so it's been a fair compromise. On the bag is my sleeping mat, a Hyalite Peak Elite AC. This is a full length, inflatable mat with raised chambers running the full length to help prevent rolling off in the middle of the night. It's surprisingly compact, lightweight (367g) and has done the job despite minus 10C nights. Also on the bag is my tent. This is a Tarptent Scarp 1 that I bought secondhand. It weighs 1,488g with poles, pegs etc and has a very flexible pitching system that makes finding a spot easier. Great ventilation and two porches make it possible to store wet gear under one whilst cooking under the other and having the option to use the most sheltered porch for cooking or simply for the best view. The three drybags are from Exped and are used to keep some clothing dry and for keeping some bits and pieces together (and therefore easier to locate). For cooking, I'm still using gas. It's clean, quick and feels safest when under cover. The stove is an Optimus Crux. It folds so that it can be stored in the concave underside of a 250g gas cartridge. It seems to be very efficient but suffers from not having a great simmer. If set low it will often go out altogether. For lighting the stove I have a Light My Fire Swedish Firesteel. This works in all conditions so I'm less worried about trying to keep matches dry or having a lighter simply fail on me. I have a windshield that clamps onto the gas cartridge. It's made by Primus and I reckon it pays for itself in fuel saved in windy conditions. The Titanium Spork is handy as a single eating implement and, being foldable, stores in the pans. However, the wire handle collects bits of food and eating off titanium isn't the most pleasant sensation (or maybe that's just me). The wee sponge scourer is handy for getting the remnants of last nights meal off before breakfast and also for mopping up any spills and leaks. The pans are the Optimus Terra Weekend HE cook-set (271g). I find some of the smaller "solo" options a bit small for decent portions sometimes. The Terra Weekend is large enough to take all the items I've mentioned above. The pot cosy is home-made from silver "bubble wrap" and duct tape. It's an efficient way of cooking whilst using less gas as it keeps everything hot. Even cook in the bag meals work better as they remain warm while rehydrating. The Lifeventure Titanium 450 mug is great for just having a brew or a soup when awaiting the main course. It gets a bit hot on the stove and can burn your lips so I've put a "charity wristband" around the lip. You can never travel without a knife and a wee Swiss Army knife is simple enough. The hipflask is a true morale booster as there's nothing like a wee dram when you're sitting watching the sun go down. The clothing choice is fairly simple - it's mostly whatever I'm wearing to cycle. However, it's important to have something dry to put on in your bag if you get soaked - even if only for morale. The Montane Prism jacket is just one of the best things ever. It's usually the first thing I reach for when I stop. It folds into its own pocket and provides an amazing amount of warmth. The Rab Aeon Tee-shirt is "silk-weight". It's enough to give a bit of comfort and warmth but is also a great baselayer under cycle clothing in warmer weather. Ronhill Tracksters might be very old-school but they are light enough to take anywhere and who cares about fashion when you are miles from anywhere? I had a couple of trips with cold hands. The winter bike gloves can be a bit bulky around the campsite, especially when fiddling about with the stove. These Decathlon silk liner gloves provide just enough of an insulation layer to keep the worst of the chills off. A spare pair of lightweight socks are great in the sleeping bag and a buff acts as a scarf, hat or even a towel when necessary. 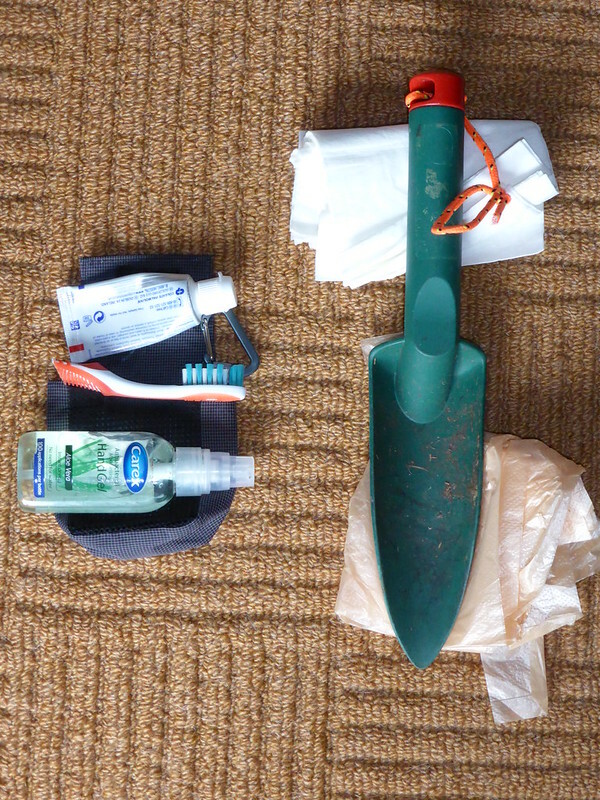 Toileting is taken care of with a small gardening trowel, a bit of toilet tissue and some nappy sacks (if "packing out" becomes necessary). Yes - I've cut my toothbrush down. This isn't to save weight you understand, just so it will fit in a wee bag. A travel-sized tube of toothpaste is enough for a few nights and it makes such a difference having a fresh mouth. Anti-bacterial hand gel is a clean and effective way of ensuring a level of hygiene. 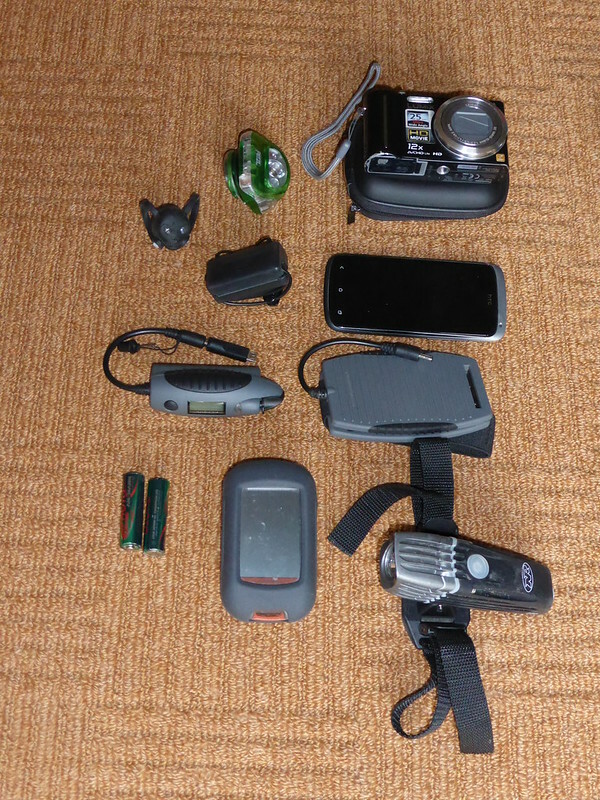 I'm not a massive gadget fan when bikepacking. The coming of the Smartphone seems to have given us most of our needs in one device but mine usually stays in Airplane mode or switched off. That way the battery is still going to work in an emergency. The green Petzl headtorch is used around the campsite. It has a couple of power settings and also a red LED that sounds great in theory as you can read a map at night without ruining your night vision. But have you tried looking at contours on an OS map when under a red light? The Panasonic TZ7 camera has given me some great shots and is usually carried on the bike so it's always at hand. The little black box contains a set of JVC earbuds in the event I want some music at night. they are rarely used as I prefer to listen to what's going on around me. The Powermonkey Explorer is a charger and a solar panel. The latter is pretty much useless in Scotland in winter but you never know.... If I've used the phone at all, I'll usually top it up overnight. A headlamp and tail-light are really for emergency use only. Unless conditions change for the (much) worse or I have some other mis-calculated event I prefer to pitch before nightfall, even on the short winter days. The Garmin Dakota GPS is a bit of an upgrade from the old Geko 301 I was using previously. It has the OS 1:50K maps built in and a set of AA batteries will last for around 10 hours. However, I still print off a map of my route as I like to have a backup. Finally, here's where it all goes. The bag on the right is a Revelate Sweet Roll. It holds the tent, mat, cookset (and contents), mug, spare clothing, gadgets and any food I need overnight.The Pocket on the front is handy for some ready-to-grab bits like hand gel, wallet, maps. The other large bag is a Revelate Viscacha saddle bag. For winter, I can just fit the big sleeping bag and a couple of other small items in here. 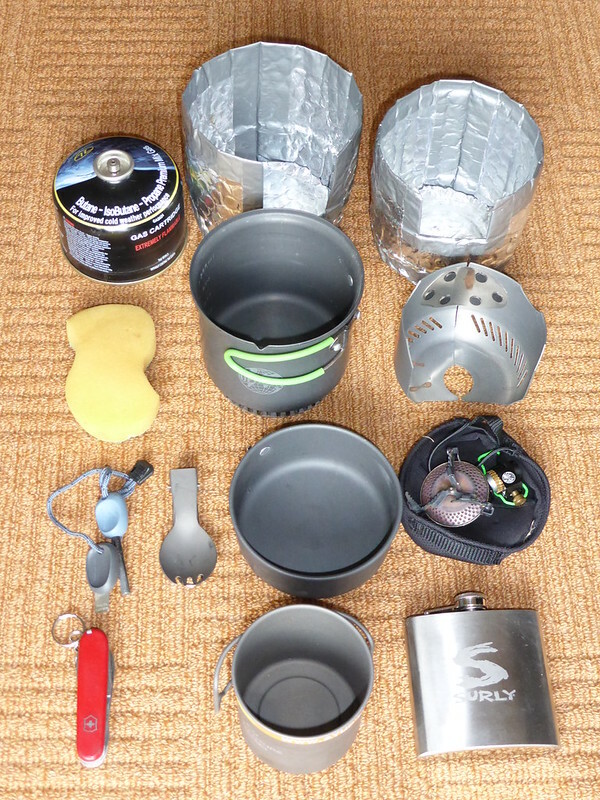 The little bag is a Revelate Jerry Can. It fits on the top tube of the bike, just in front of the saddle, and holds the bike toolkit. You can now buy the Revelate bags in the UK from Backcountrybiking in Aviemore. Bottles, pump and GPS all fit directly onto the bike. Well, that's about it. I weighed all the gear above (but not the bags) and got a weight of 8Kg. Onto that, there's any food I'm carrying, water and the bike clothing I'm wearing plus a waterproof jacket. I'm hoping to get that down a wee bit now that "summer" has arrived and a future blog post will show how I'm doing that. In the mean time, here's a photo of the bike fully loaded on the Rob Roy Way above Strathtay. 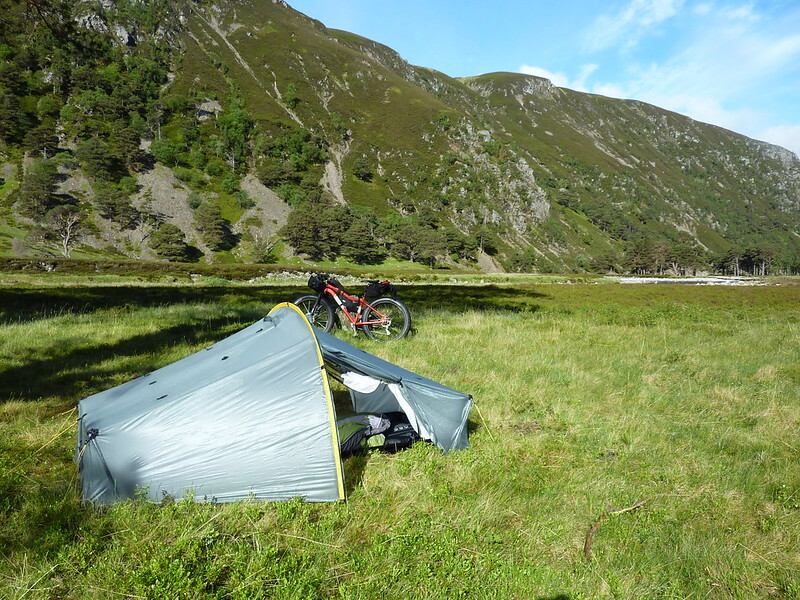 If you've been following my blog since last summer you might remember that I went off to do some Bikerafting in Aviemore with the guys from Backcountrybiking. I had a great time, learnt loads and came away convinced of how useful a Packraft could be in Scotland. I took advantage of a little pre-Xmas sale to buy a raft, paddles and inflator and have since added some rigging to the raft and an inflatable gilet. However, my opportunities to use the equipment have been somewhat hampered by the weather. If it's not snow, it's gales and neither are that conducive to setting out in a lightweight raft. Paddling round the Pentlands reservoirs is nice, but today I finally made it onto some moving water in the shape of the Tweed. The weather forecast was looking decent and we'd had some recent rain so I was hoping that the water level would be sufficient. The Tweed is handy too - there's a big car park in Peebles right by the river and various paths, tracks and roads for returning on the bike. Of course, the day I decide to go down to Peebles, it turns out to be the Gala day. Not only is the car park rammed but the riverside paths were being used for the kids races! So, rather than have a quite play around during setup, I had to get on with it in front of an audience. I'm sure a few were wondering what I was up to when first I got the raft out, then started inflating it, then strapped the bike on. This was the first time I'd carried a bike on my own raft and I was pretty nervous about it. I first strapped on my (now almost empty) rucksack, with the bike on top. I reasoned this would protect the raft from any sharp bits. Having got that sussed out, I blew up my inflatable gilet, slid the boat down to the river and slipped inside. The water was flowing pretty fast at this point so it didn't take me long to get away from the park and settle into some paddling. Most of the trip was quite straightforward. I'd look ahead, try to spot any unsettled patches in the water, steer around them and carry on. Occasionally, it would get a little wilder as the river burbled over some rocks but it all seemed to be going exceedingly well until I reached a little island near Cardrona. The right channel was fast and deep, but a number of trees seemed to be across it so I steered towards the island and pulled the raft ashore in order to have a better look. I'd been correct - that channel would have been a really, really bad option. That left me with a wider, shallower left channel that started OK but eventually got so shallow that I grounded and had to exit the raft mid-stream. Of course, that meant my shoes and socks were now full of water! Once under way again, I managed to avoid any more scrapes and just enjoyed the rather different views I was getting of quite a familiar stretch of land, although rounding one bend I hit such a headwind that I was actually getting blown back upstream! My original plan had been to go all the way down to Innerleithen but I'd had a late start and made slower than expected progress so I found a decent bit of bank to scramble ashore and set about removing the bike, putting it back together, deflating the raft and packing everything for the short spin back to Peebles. Some sort of more aquatic footwear required, probably teamed with Sealskinz socks and flat pedals. Get a protective sheet for the raft so I can put the rucksack on top of the bike. It was rubbish having no access to snacks! Set off earlier, especially when there's not a huge current to sweep you along. Still, it's all a learning process and I feel this is setting me up for a couple of longer trips I have in mind for the next couple of months.